Jan and I lived together through our senior year in college when my baking experiments really took off. She put up with a messy kitchen, lots of dirty dishes and my crazy baking moods. Usually, it was me baking, her keeping me company with wine and conversation and the both of us enjoying the finished product, but on a couple of occasions Jan took my baking to the next level. I was in the mood to bake some bread one afternoon and decided on a cinnamon swirl bread that really caught my eye. I spent the day baking and when the bread was finally finished I popped a slice in the toaster and spread some butter on it. It was delicious. 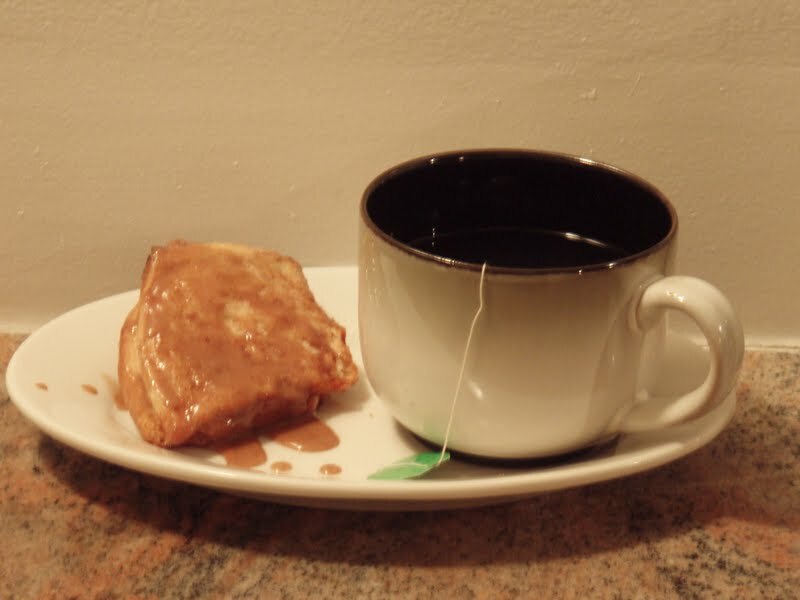 I thought that was it, until the next morning I woke up to the most wonderful smell of Jan cooking french toast for breakfast with the cinnamon swirl bread. It was even more delicious that I could have imagined. 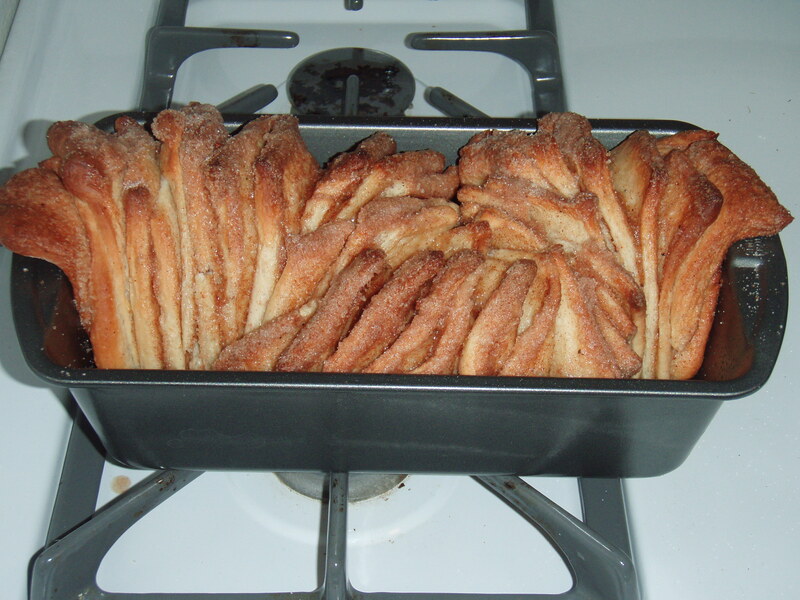 Anyway, long story short, Jan will be coming to NYC tomorrow to celebrate my birthday with me and I’m very excited to bake this Cinnamon Sugar Pull-Apart bread as a thank you for putting up with all of my crazy baking days in college! 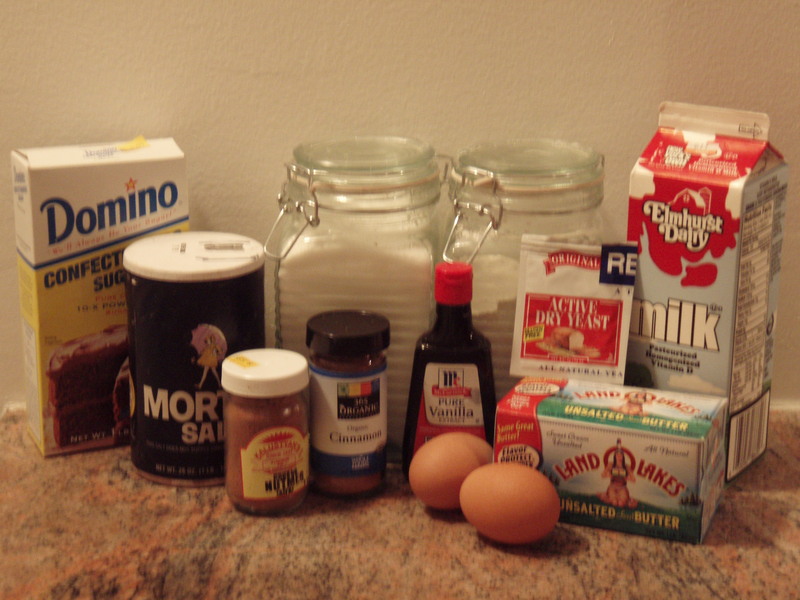 In a large bowl, whisk together 2 cups of the flour with the sugar, yeast and salt. Set it aside for later. In another small bowl, whisk together the 2 room temperature eggs and set them aside for later as well. In a saucepan on the stove, melt together the milk and butter until the butter has just melted. Take the mixture off the heat and add the water and vanilla extract. Let the mixture rest for about a minute or two. 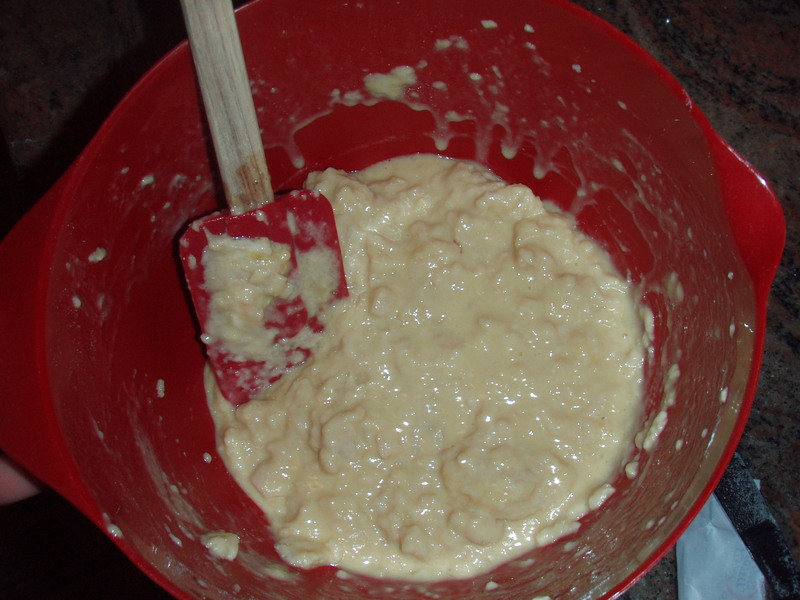 Pour the milk and butter mixture into the dry ingredients and mix with a spatula. Add in the eggs and continue to mix until the eggs are fully incorporated. The mixture will be a bit soupy, but continue to mix until the dough and the eggs come fully together. 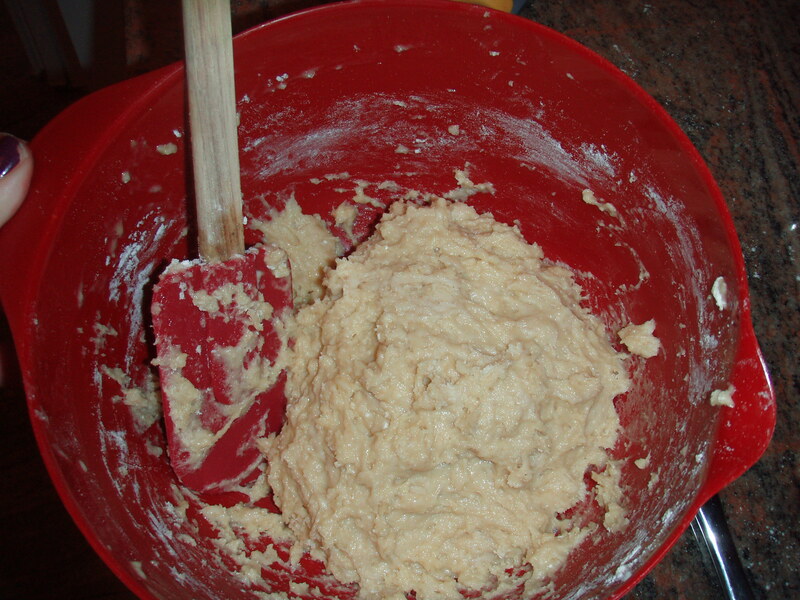 Add the remaining 3/4 cup of flour and continue stirring until the dough forms, 1 to 2 minutes. The dough will be sticky. This is what you want. 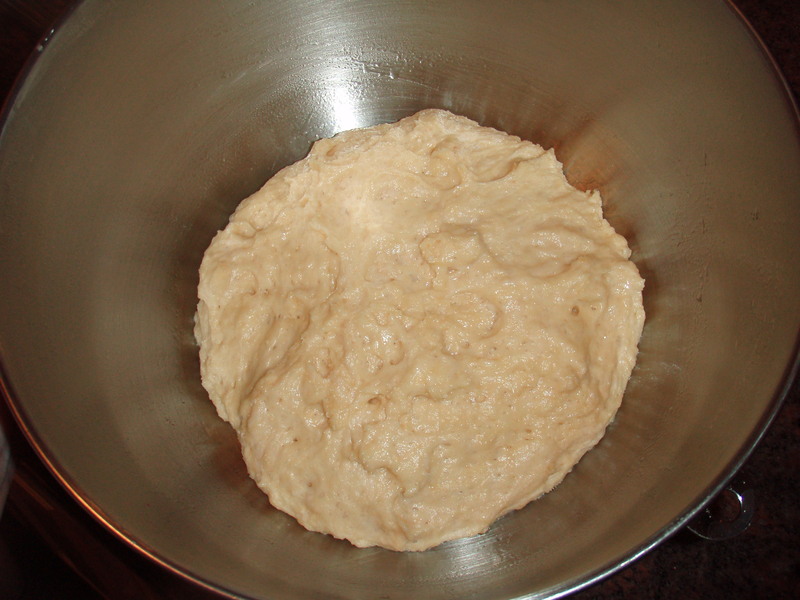 Place the dough in a large, greased bowl and cover with plastic wrap and a clean kitchen towel. Place the bowl in a warm space to allow it to rest until doubled in size, roughly 1 hour. Everyone has their own method to letting dough rise. I happened upon my method by accident one afternoon in college. Dough needs a warm, dark and low traffic space to rise. It needs to be quiet and undisturbed. In a small college apartment there really aren’t many spots with all of those elements, so I went with the darkest, which happened to be the bathroom. Lucky for me, it happened to also be the least traffic area, with only 2 girls living there, and there was a space heater built right into the wall. It was the perfect bread rising room! Now, living in NYC, where you’re lucky if you can find a bathroom with enough room to fit yourself, let alone a bowl of rising bread and a space heater, I’ve managed to make it work… Until tonight, when my tiny space heater blew a fuse and all my lights shut out, but I was back up and running in no time! 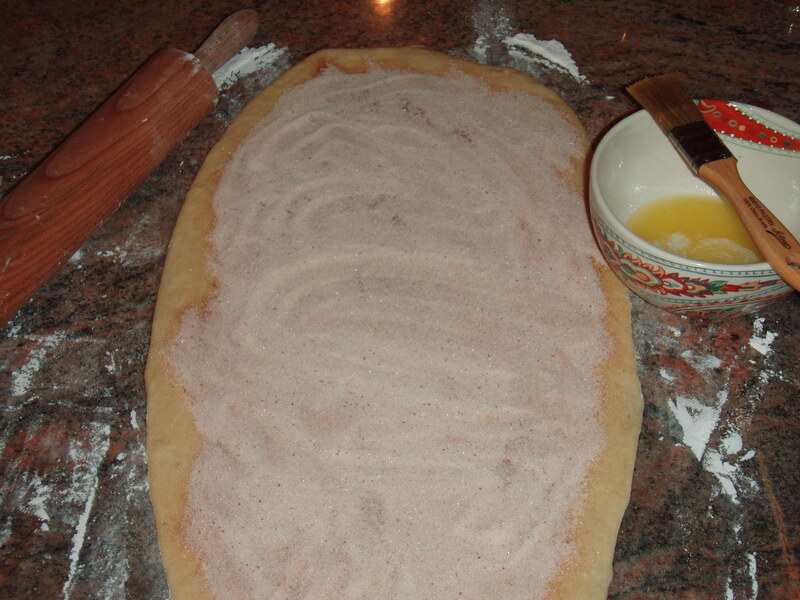 While the dough is rising, in a small bowl whisk together the sugar, cinnamon and nutmeg for the filling. In another bowl, melt 2 ounces of butter until slightly browned. Grease and flour a 9x5x3 inch loaf pan. Set both bowls and the loaf pan aside. Once the dough has risen, we are going to take it out of the bowl to deflate it and knead into it roughly 2 tbs of flour. Once that’s kneaded together, cover the dough with a clean kitchen towel and let rest for 5 minutes. 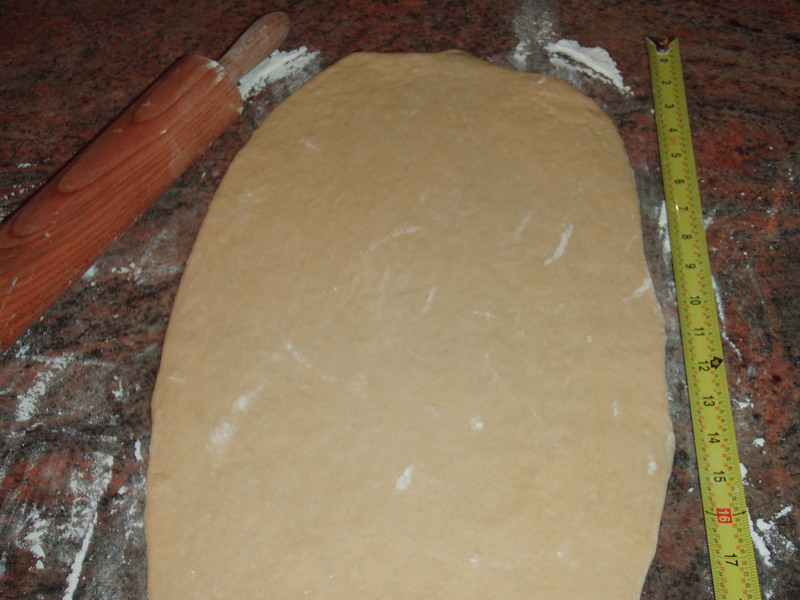 On a lightly floured work surface, use a rolling-pin to roll the dough out to be 12 inches wide and 20 inches long. The dough may be a bit tough to roll out at first, but just keep working with it. If you can’t get it to the exact dimensions, it’s not a big deal, just work with what you have. 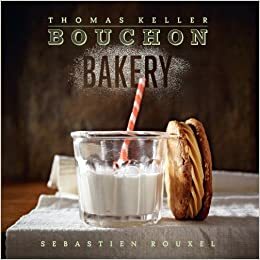 Use a pastry brush to spread the melted butter across all of the dough and then sprinkle with all of the sugar and cinnamon mixture. Be generous and use ALL of the mixture! You can never have too much cinnamon sugar! 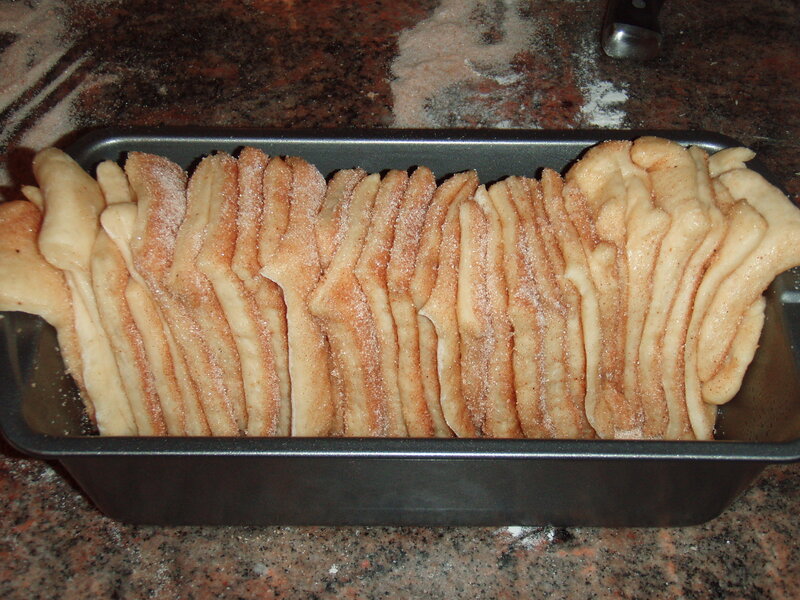 Slice the dough vertically into 6 equal size strips. 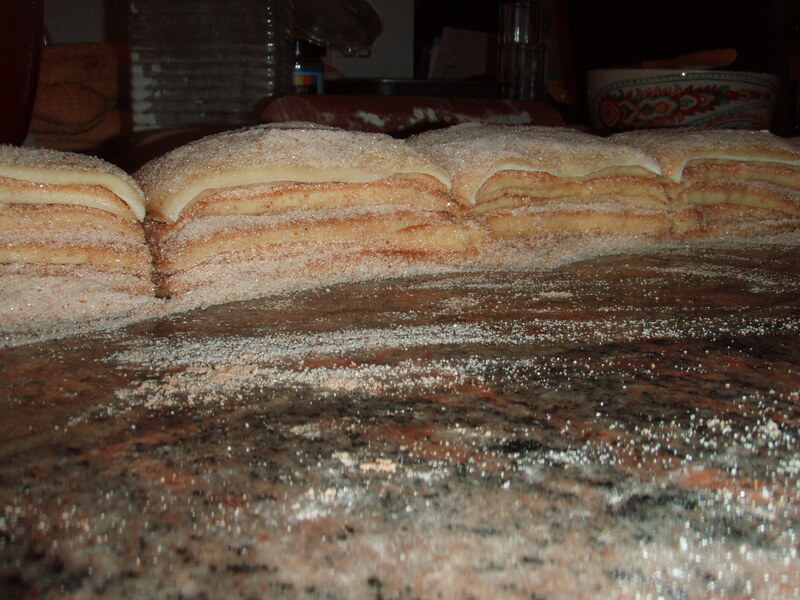 Stack the strips one on top of the other and then slice horizontally into 6 equal slices again. You now have 6 stacks of 6 squares. Layer the dough squares in the loaf pan vertically, like a flip-book. Place a kitchen towel over the loaf pan and allow to sit in a warm place for 30-45 minutes or until almost doubled in size. 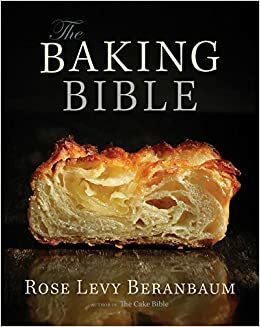 As the dough is rising in the pan, place the rack in the center of the oven and preheat to 350 degrees F. Once the dough has risen, place the loaf in the oven and bake for 30 to 35 minutes until the top is very golden brown. This will ensure that the bread is baked all the way through and cooked well. Remove from the oven and allow the bread to rest for 20 to 30 minutes. 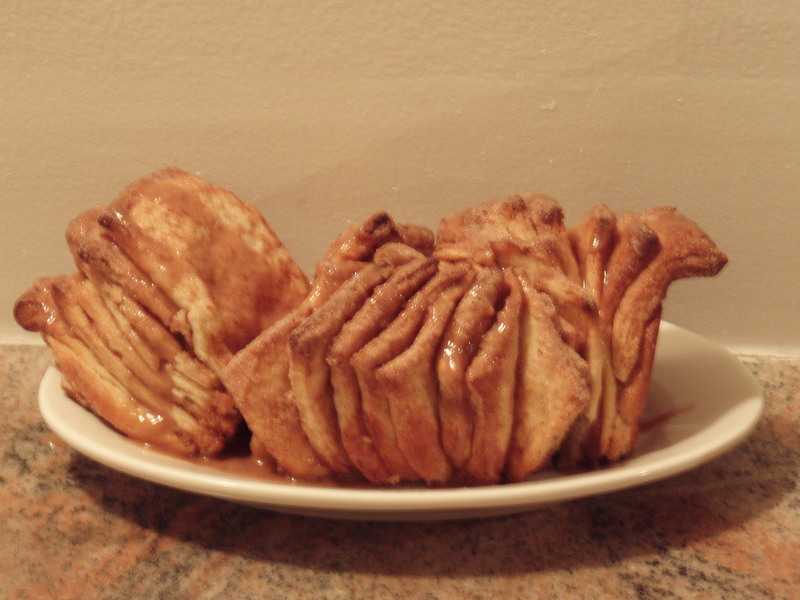 As the bread is resting, whisk the confectioners’ sugar, milk, cinnamon and vanilla together to create the icing. Once the bread is cooled, run a butter knife around the edges of the pan to loosen the bread and invert onto a clean board. Place a stand or plate on the top of the upside down loaf and carefully invert it so that it is right side up. 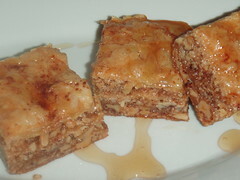 Drizzle with icing and serve warm! This looks unbelievable! I wish I had any integrity or motivation to make this myself.